The Rite of Confirmation is an occasion for a person who was baptized as a child or infant to make a mature and public affirmation of their faith and commitment to the responsibilities of Baptism, and to receive the laying on of hands by the bishop. St. Peter’s offers a comprehensive preparation for teenagers who will be sixteen years old at the time of the bishop’s annual visit (generally those who are in at least their sophomore year in high school) and would like to confirm their baptismal promises. Adults who would like to be confirmed or received by our bishop from other parts of the Church are invited to attend the “Welcome to the Episcopal Church” class on Sunday mornings taught by the clergy. 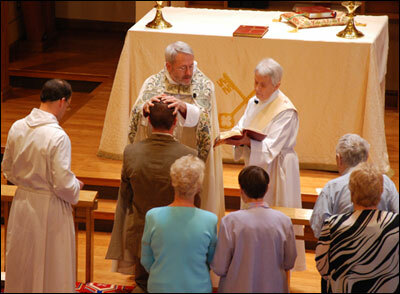 Many lifelong Episcopalians also take this class and make the necessary preparations to reaffirm their faith, even if they participated in the Rite of Confirmation at an earlier age. Click here for more Information for Confirmation of Young People.